Notes: Based on a series of light novels by Gen Urobuchi that act as a prequel to the original Fate/Stay Night, a doujinshi visual novel by Type-Moon. The show was broadcast over two seasons but it is essentially one show so I will review it as such. Fate/Zero takes place 10 years prior to the events of Fate/stay night, detailing the events of the 4th Holy Grail War in Fuyuki City. The War of the Holy Grail is a contest in which seven mages summon seven Heroic Spirits to compete to obtain the power of the "Holy Grail," which grants a miracle. After three inconclusive wars for the elusive Holy Grail, the Fourth War commences. Founded by the Einzbern, Makiri, and Tohsaka families centuries ago, the Einzbern family is determined to achieve success after three successive failures, no matter the cost. As a result, they have elected to bring the hated magus killer, Kiritsugu Emiya, into their ranks, despite his methods and reputation as a skilled mercenary and a hitman who employs whatever he can use to accomplish his goals. When it comes to reviewing I sometimes wish that I wasn't already a fan of things, Type-Moon being the thing in question this time. I can't help it though, the po-faced seriousness that all of their games, books and subsequent adaptations approach such a ridiculous and convoluted subject matter is something I find incredibly charming and I'll be damned if they don't do a good job of it too. This fandom, however, leaves me in a different situation to those of you who are either ignorant or unfavourable towards Type-Moon properties. When watching Fate/Zero, I kept my eye on how well it ran with the already established canon because that is what fans do when faced with a show written by someone other than the original creator, Gen Urobuchi (of Phantom: Requiem for the Phantom and Madoka fame) in this case. That said, let it be my first and last word as a fan that as far as consistency goes, Fate/Zero does very little to upset the canon purist and even more impressively, very little to put-off the layman either. To put it simply, Fate/Zero is a very good show and probably the best Type-Moon based TV series around. For one it looks fantastic, whatever money the franchise has made so far has been well spent in making this one of the most visually impressive TV series to date, smooth animation and consistent artwork coming together to make crisp, evocative action scenes to get the heart racing. The character designs are simple for the most part but still appealing, as a legion of Saber-fanboys will tell you, and they have personalities to match. Probably the greatest and most interesting shift from Type-Moon's own style and the main reason why I really like the show is the time and effort that Urobuchi puts into the majority of the characters. Motivations are explored and contrasted, relationships grow and are expanded upon and all this gives the superb action context and meaning. Personal highlights are the Emiya/Kirei relationship that is somehow built up despite the characters barely conversing over the course of the show, the relationship of the three kings, Saber, Rider and Archer, and their opposing philosophies and beliefs as heroic spirits and the charm and charisma of characters like Iksander. The basic story also holds up well and connects the big set pieces in a more than adequate manner. There are problems though and the biggest of them is the plot pacing. To be blunt, Fate/Zero is at times just far too slow to be a pristine action series and the early episodes are especially bad for this. I'll admit that I find it pretty difficult to be too damning, most of the time is spent introducing characters and setting up the scene and the background for the Holy Grail Wars, but slow is slow and it takes time to get moving at any real pace. There is also the problem near the end where a few episodes are dedicated to the back story of Emiya's (the show's nominal main character) life, which are certainly not purposeless (they make sense out of his character), but still slice away any sense of climax from the end. In essence that is a problem with the whole series, as interesting as the characters are and as awesome as the action scenes are, the show never felt like it was building to something bigger than its individual events - the end no bigger than the middle. Despite the show's qualities, I never once felt that compulsion to keep watching, no overwhelming hunger to find out what was going to happen next - like Urobuchi's other series, the show invites no strong emotional attachment despite how interesting they may be and it ultimately holds each of his shows back from greatness. Overall, I cannot say I am disappointed. Beautiful and undoubtedly interesting, like a Christopher Nolan film, the series delivers an exciting and intelligent story that I'm sure even non-Fate/Stay Night fans can enjoy. Also like a Nolan film, the series lacks heart and fails to engage at the emotional level it may well have done with only minor changes. I have no reservations recommending this show though, it's blockbuster anime at its finest, and is well worth your time if you're looking for a smartly written action series with the visuals to match. 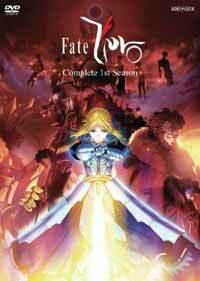 However you feel about Fate/Stay Night, Fate/Zero is a fine watch. Recommended Audience: Plenty of violence, some blood and a generally dark tone make this one that's not for kids. Most of the scenes involving the Matou family are pretty disturbing too.